Gather your ingredients and heat oven to 350°F. Line bottom of a 10-inch round springform pan with parchment paper, then lightly spray pan with cooking spray (alternatively, you can use a greased 13 x 9-inch pan). 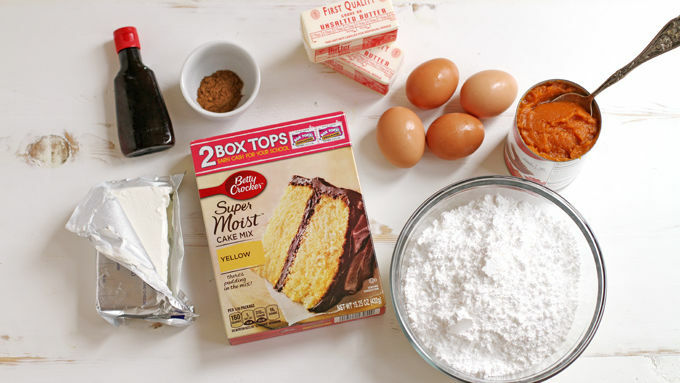 Cake base: In a large bowl or bowl of a stand mixer, beat cake mix, melted butter and egg until well combined. Spread and press batter evenly into bottom of prepared pan. 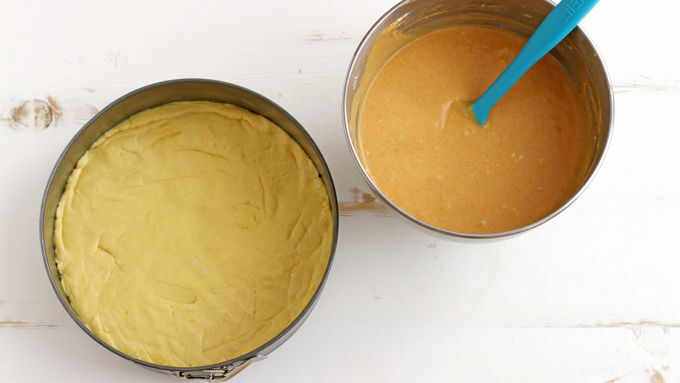 Filling: In another large bowl (or clean bowl of a stand mixer), beat cream cheese and pumpkin until well combined. Add melted butter, vanilla and eggs; stir until combined. Stir in powdered sugar and pumpkin pie spice until just combined. Pour batter evenly into pan over cake base. Bake 1 hour to 1 hour 15 minutes, until center of cake is just set and slightly wobbly (if using a 13x9-inch pan, lessen the baking time). Cool completely on a cooling rack. Remove sides of springform pan. Serve slices of cake with caramel sauce and candied pecans on top. Purchase candied pecans at the grocery store or make your own. Plain pecans can be substituted for candied if desired. 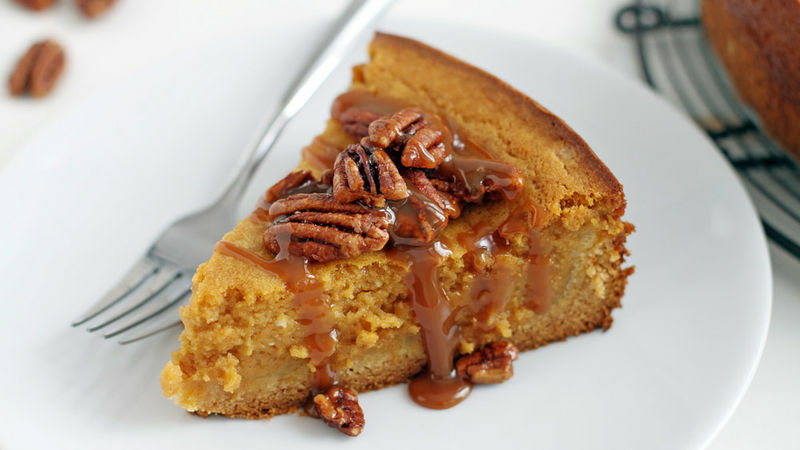 Classic gooey butter cake dressed for fall with pumpkin and pecans. Who can resist this cake? Forget the pumpkin pie – heck, you can even forgo the turkey! This year, Thanksgiving is all about the Gooey Pumpkin Butter Cake. Or at least mine will be, anyway. I’m a big traditionalist when it comes to Thanksgiving. It’s my second favorite holiday behind Christmas, and that's because my mom’s Thanksgiving dinner is the best meal of my year. It would be my last meal if I could choose it, it’s so omnomnommy. And she always makes a pumpkin pie that is to die for. 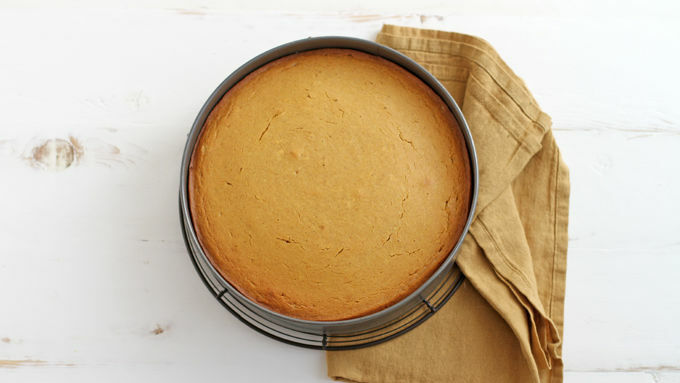 But you see, then I went and met pumpkin gooey butter cake. 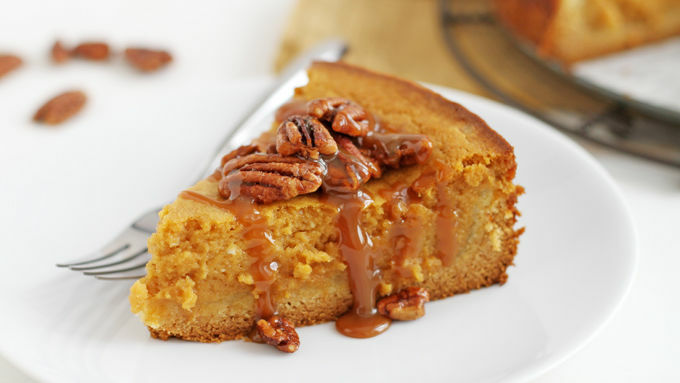 And it was topped with candied pecans and caramel sauce… and, well, I just think it’s about time to break tradition (I love you, Mom! Please still make me that sweet potato casserole I like because you’re pretty and smart and amazing). And I think once you give this recipe a try, you’ll want to add it to your Thanksgiving – or weeknight – menu, too. Purchase candied pecans at the grocery store or make your own. Plain pecans can be substituted for candied if desired. After baking it’ll still wobble a bit when it’s done, almost like a cheesecake, but that’s good: overbaking will cause the cake to be less gooey and we really want all that gooeyness. New Thanksgiving tradition: Faceplant into this cake.